Scientists at the Fisher Center for Alzheimer’s Research at The Rockefeller University, a leading research group devoted to finding the underlying causes and a cure for Alzheimer’s disease, showed how connections between nerve cells in the brain change and play a key role in the onset of Alzheimer’s. In a research project headed by Drs. Eric Snyder and Nobel laureate Paul Greengard, the provocative findings open up new avenues of research into a devastating brain illness that afflicts some 4.5 million Americans. In an accompanying news report in the medical journal Nature Neuroscience, Dr. Rudolph E. Tanzi of Harvard Medical School calls the work of the Fisher Center scientists “a major leap forward.” If confirmed, the findings may lead to effective new treatments for the mind-ravaging illness. Scientists have long suspected that a toxic protein called beta amyloid, which builds up in the brains of those with Alzheimer’s, plays a key role in the disease. This is called the amyloid hypothesis. However, exactly how beta amyloid causes Alzheimer’s has remained a matter of intense scientific debate. It was known that a toxic form of beta amyloid accumulates in the brains of those with Alzheimer’s, forming dense, fibrous deposits called plaques. The buildup of these plaques had been thought to cause brain cells that are critical for memory and thinking to die. The result is Alzheimer’s disease. Scientists have long known that nerve cells in the brain communicate with one another by transmitting chemicals, called “neurotransmitters,” from one cell to the next. The vast network of nerve cells that make up the brain form a kind of super network, with nerve cells “talking” to one another through the medium of neurotransmitters and, in the process, laying down memories and thoughts. The spaces between nerve cells, called synapses, are critical for the transmission of information by neurotransmitters. It has become known that in Alzheimer’s disease, synapses deteriorate even before cells die, and this disrupts communication between nerve cells. Beta amyloid is believed to be responsible for this disruption. In the study just reported, Fisher Center scientists learned how beta amyloid disrupts communication across the synapse, and thus how the symptoms of Alzheimer’s arise. Fisher scientists showed that beta amyloid binds to certain receptors on the surfaces of brain cells and causes other receptors, known to be responsible for memory and thought processes, to be “swallowed” up by the cells. The disappearance of these surface receptors terminates connections the cells might have made with other cells. As communication between brain cells is interrupted, memory and other thought processes gradually weaken, personality traits may be altered, and Alzheimer’s take hold. The hunt by Fisher Center scientists for underlying abnormalities in the brain that lead to the onset of Alzheimer’s is critical for combating the disease. Identifying such defects sheds new light on mechanisms in the brain that contribute to the illness. This research may also lead to new drugs and effective treatments targeting brain defects that cause memory loss and Alzheimer’s. The Fisher Center for Alzheimer’s Research Foundation is leading the way in basic research into the underlying causes of Alzheimer’s disease. 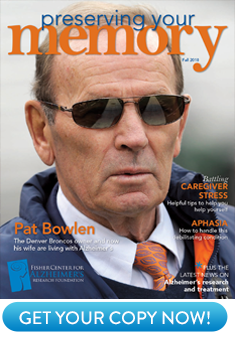 For more on how the Fisher Center is working toward the search for a cure, visit the www.ALZinfo.org. Rudolph E. Tanzi: “The Synaptic A-Beta Hypotheis of Alzheimer disease.” Nature Neuroscience, Volume 8, Number 8, August 2005, pages 977-979. Eric M Snyder, Yi Nong, Claudia G Almeida, et al: “Regulation of NMDA receptor trafficking by amyloid-beta.’ Nature Neuroscience, Volume 8, Number 8, August 2005, pages 1049-1056.